Congregation Nevei Kodesh is known for its creative, meaningful and joyful embrace of the spiritual riches of the Jewish tradition. Situated at the foothills of the Rocky Mountains in beautiful Boulder, Colorado, we come together to seek an authentic, inclusive, egalitarian expression for Jewish life in the 21st century. Established in 1993, Nevei Kodesh is an extended family of people from diverse backgrounds, including Jewish, interfaith and multi­cultural families, singles, couples, seniors, Jews by choice, LGBTQ people, and participants in other spiritual traditions. All are welcome! In 2014 we entered a new chapter, welcoming a new rabbi, Rav Sarah Bracha Gershuny, and buying our own building, a beautiful former church on Glenwood Drive at 19th St. We look forward to seeing you soon! 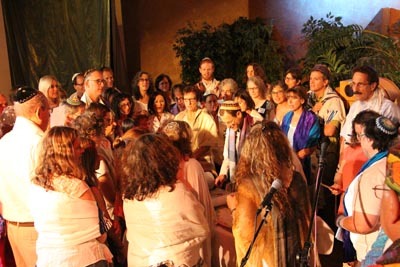 To revitalize Judaism as a transformative spiritual path for the 21st century. To build a dynamic, inclusive, multigenerational, participatory community dedicated to renewing Jewish tradition through engaged spiritual practice, meaningful study, and responsible social action. Read more: What is Jewish Renewal?